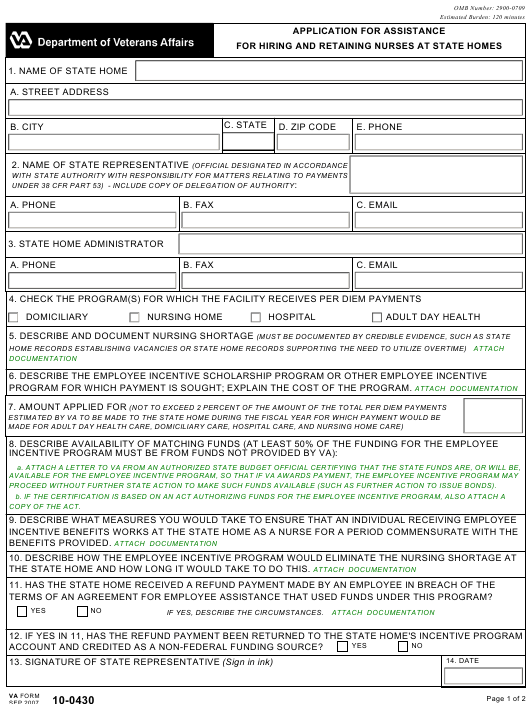 VA Form 10-0430 is a United States Department of Veterans Affairs form also known as the "Application For Assistance For Hiring And Retaining Nurses At State Homes". The form was last revised on September 1, 2007 - download an up-to-date fillable PDF VA Form 10-0430 down below or find it on the Veterans Affairs Forms website. PROGRAM FOR WHICH PAYMENT IS SOUGHT; EXPLAIN THE COST OF THE PROGRAM. PROCEED WITHOUT FURTHER STATE ACTION TO MAKE SUCH FUNDS AVAILABLE (SUCH AS FURTHER ACTION TO ISSUE BONDS). THE STATE HOME AND HOW LONG IT WOULD TAKE TO DO THIS. TERMS OF AN AGREEMENT FOR EMPLOYEE ASSISTANCE THAT USED FUNDS UNDER THIS PROGRAM? ACCOUNT AND CREDITED AS A NON-FEDERAL FUNDING SOURCE? SEND YOUR APPLICATION TO THIS ADDRESS.